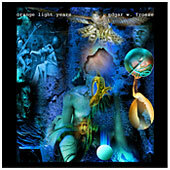 ORANGE LIGHT YEARS is the quintessence of Edgar’s work through the last three decades. A fine mixture of electronic sound textures and “handmade” guitar and piano parts. One of the latest titles like "Talking to Maddox" meets the all time mellotrone classic “Maroubra Bay”. His musical handwriting here is a very private affair and mirrors also the strong backbone work behind Tangerine Dream.